In what form does a spiritual community appear? How many times, as a non-Catholic, do you get the chance to participate in a small mass, seated next to a woman who defines herself as an atheist from Alaska? 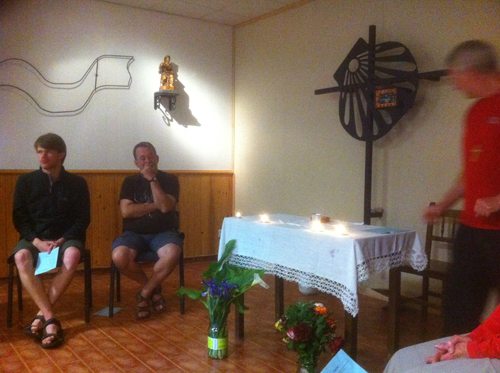 That’s how impromptu spiritual community unfolds on the Camino. 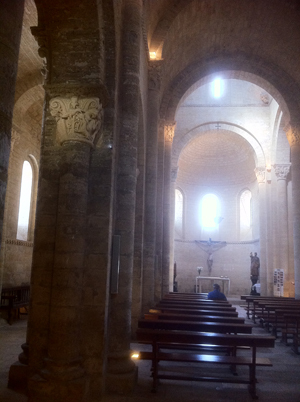 In Santa Domingo, on day 12 of my pilgrimage, I participated in a eucharist mass, not even knowing what that term meant. As someone who nearly winces at the terms “God” and “Lord” and rejects patriarchal organized religion, I wondered what I was doing there. But a deeper part of me, longing for some form of collective spiritual connection or divine validation, felt in the right place. Eleven pilgrims—a jocular late-forties Irish priest who was questioning his loyalty to the church; me; two twenty-something Catholic men from Philadelphia and two from Hawaii; a self-professed atheist; a middle-aged male Irish Protestant; a middle-aged female Irish Catholic; a 50ish Lutheran minister from Saskatchewan; and one man I never spoke to—gathered in an upstairs room at an albergue. I had met the presiding priest earlier on The Way and admired his playful approach to life, his commitment to grassroots social reform and his growing sense of alienation from his church hierarchy. In my view, he was an anarchist at heart. I knew that his willingness to perform this mass to a mixed group of believers and non-Catholics was verboten by his church’s traditional regulations. The Lutheran minister later warned me not to even mention the priest’s name in any subsequent public writings since he could be ex-communicated for such a supposedly treasonous act. Ah, a cabal of rebels: my kind of crowd. The priest acknowledged the diversity of our group and gave us all the option of either taking mass or asking for a blessing. As we sat in a circle, holding hands and singing a hymn, I found myself crying, feeling goose bumps and chills, my own form of soulful recognition of something beyond description. The priest had asked me to read Corinthians 1 verses 1-7. I hadn’t read a Bible in decades. Grace and peace to you from God our Father and the Lord Jesus Christ. I told myself: Keep an open mind. Ignore the holy trinity language. Connect to the spirit of the words. I enjoyed reading aloud; it reminded me of old Sunday-school sessions and school performances. Yet I still felt disconnected from these phrases. What relationship did they bear to my life? My chattering mind continued. It’s just another form of saying a connection to All That Is. Don’t be so judgmental. Stay open to whatever form you might receive a teaching. Why do you continue to promote a sense of separation? We are all One. “The eucharist relates to the washing of feet,” the priest told us. As pilgrims, we could all relate to a focus on our weary soles. 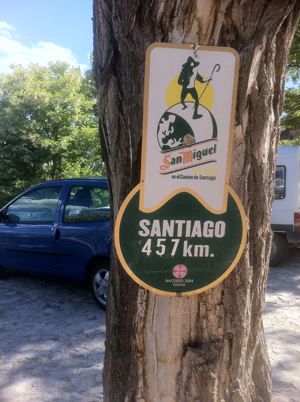 Along the Camino, monks and nuns at some albergues even wash the feet of pilgrims. Our holy host spoke of our common link as people walking The Way. I felt blessed, grateful to be part of this loose-knit yet intentional gathering. Immediately afterwards, one of the young German men was openly crying. A lapsed Catholic, this was his first mass in many decades. Something had reached him. I read somewhere that everyone who walks the Camino cries at least once along the way. Later, some of us went for dinner at a restaurant, relishing a Pilgrim’s Menu that included red wine. This was not the Last Supper, which the eucharist commemorates, yet it reinforced a different form of fellowship, a sharing of bread and wine between global souls. 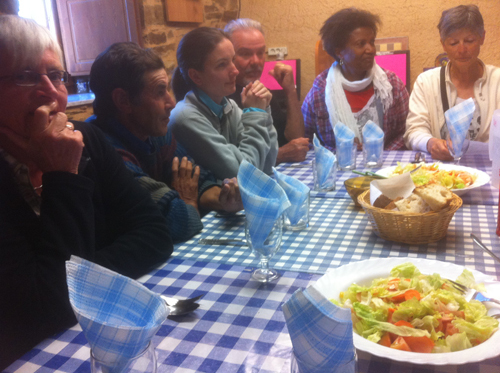 Communal meals on the Camino are their own form of sacred gathering, like the one I experienced on day 26 at the parochial albergue, Apostol Santiago, in Acebo. By the time I arrived, I felt as if my feet and ankles had been beaten with wooden paddles. But the two matronly hospitaleros, full of laughter and kindness, welcomed me warmly and after much-appreciated rest on my dorm bed, I felt more invigorated. 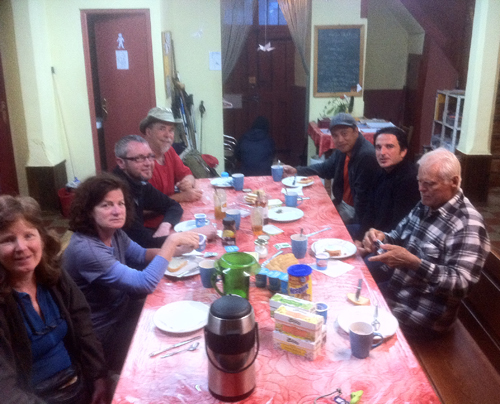 By 8 pm that night, I joined about a dozen pilgrims from France, Germany, Spain, Portugal, Belgium, Hungary, and the U.S. for a dinner of salad, lentil soup, and watermelon slices for dessert. 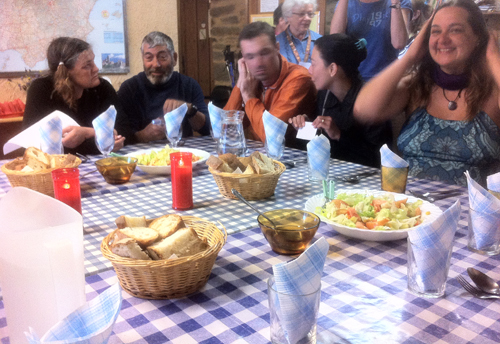 Before eating, we all read a sheet provided by the albergue, which spoke about the Camino as both an inner and outer journey, how it becomes part of you, you become part of a community and so on. Each of us read aloud a translation, in our own language, of the same message; there were at least eight versions and we listened to each one consecutively. The Hungarian man was last to read; the hungry Belgian beside me grumbled about having to hear the same thing so many times, but I shushed him. To me, the ritual was a wonderful validation of our separate, yet unified journey. 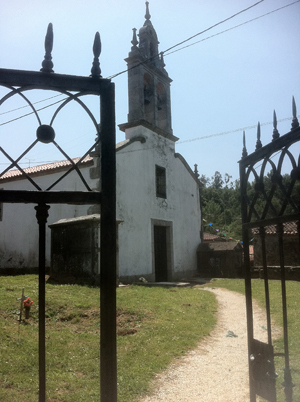 Eleven days earlier (three days after the mass), the same priest had hosted another spiritual gathering. This time, it was an ecumenical circle in an empty room on the 4th floor of the downtown albergue La Casa del Cubo in Burgos. In a facility that housed 150 beds, I had expected a large turnout but only about a dozen participated, most of them the same people from the previous mass. We sat in a circle on the floor, a backpack and pillow in the centre representing our collective pilgrim spirit and passage. 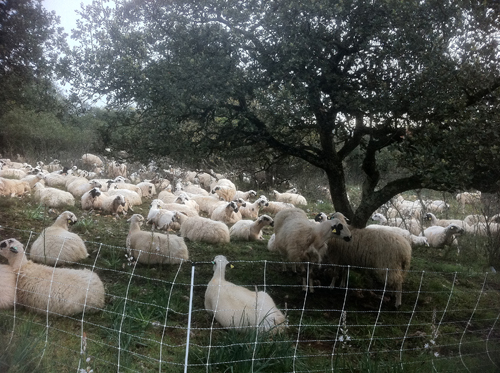 Since we had all seen herds of sheep fenced in along the path that morning, the priest used sheep and the Lord as a shepherd as a metaphor in his informal talk. He sang a hymn while the two Catholic guys from Philadelphia, both in the seminary, sang beautiful harmonies. Although moved by the sound and shared connection, I still missed my more familiar reference points, the Sanskrit chants from my yoga class, and the eastern-based sensibilities that resonate more profoundly with me. Yet, in that time and place, otherwise alone, I still felt a part of something far larger than myself, regardless of what name I or others chose to call it. What thresholds have you crossed or missed? 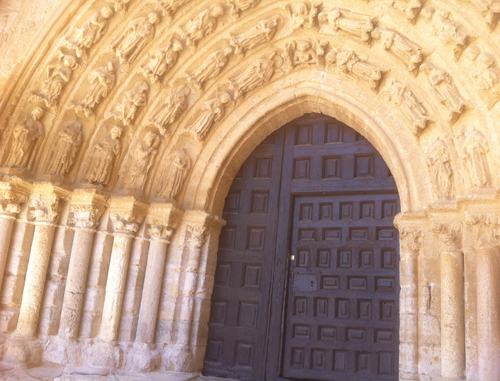 The Camino offers many forms of portals and thresholds. After walking almost 27 kilometres, I arrived in the hot, dusty town of Sahagún in mid-afternoon, looking forward to rest and an albergue bed. In mid-June, the town of about 170,000 was poised for a night of bullfights. In preparation for a small running of the bulls before the indoor event, temporary fencing of horizontal boards blocked off sections of the street surrounding the municipal albergue downtown. A youthful marching band, wearing light blue shirts and red scarves, was already playing rousing music. The young men’s brass instruments and pounding bass drum added to the loud, throbbing songs piped through a loudspeaker across the street. 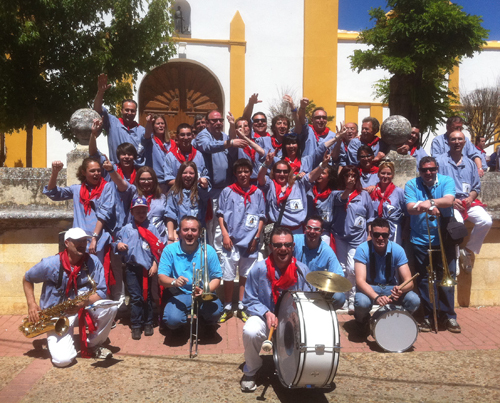 The marching band in Sahagun. I snapped this as they were posing for an official group photo. I needed to escape the sun, noise and crowds. After searching for an opening amidst the fencing, I walked up to what looked like the main doors of the municipal albergue, an imposing former church made of brick. I tried the knob and pounded on the thick wooden doors, but they were locked. No one came. Damn siesta time, I thought. Can’t I just come in and lie down? Instead, I had several lemon sodas at the bar-restaurant across the street, hoping to quench my seemingly endless thirst. Ah, the shade and cold liquid felt good. 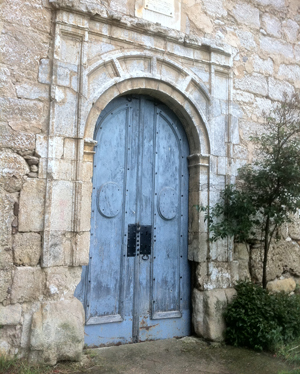 After more than an hour, I walked towards the albergue doors again, hoping that they would now be open. A young female pilgrim, sprawled on a bench to the right of the doors in beating sun, pointed past the doors to the corner of the building. I wasn’t sure what she meant. She continued to point. I followed the direction of her finger, and found myself around the corner of the same brick building, which turned out to be the front of the albergue. It was open, and people were coming in and out. I had been trying to get into the side door! An unwelcome sense of déjà vu hit me. 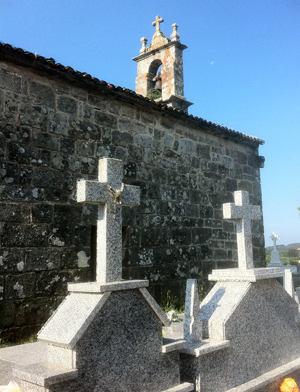 That same day, thirteen kilometres earlier in the tiny village of Terradillos do Los Templarios (population 80), I had found a square white stucco building of several storeys that bore the sign for the Jacques de Molay albergue, my desired destination. I tried a main door covered with vertical wrought iron. Locked. I knocked and rang the buzzer. No one came. Walking around the building, I tried another door. Locked. More knocks produced no one. Frustrated, I looked around for some shade. This was the only albergue in the village. How could it be closed at 1 p.m.? Feeling too tired to walk to the next town of Moratinos, more than three kilometres away, I joined several pilgrims in the shade who were waiting for a bus. I told them that the albergue was closed. “That’s strange,” said one of them. “We were just there and it was open.” After chatting for about a half-hour, with no sign of a bus, they headed to the albergue and I joined them. We turned the corner of the building, perpendicular to where I had stopped previously. 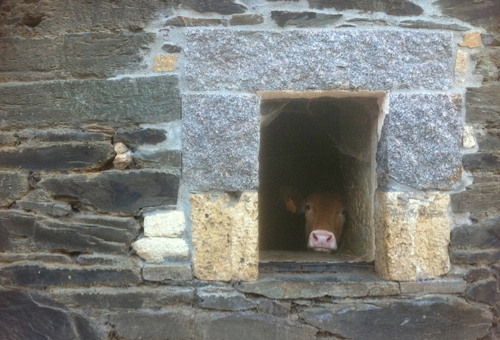 About a half-block down, an open doorway led into the albergue’s large grassy courtyard. Dozens of pilgrims sat at tables, drinking beer and relaxing. After enquiring, I found out that this welcoming spot, although now full, had been open all day. How could I have completely missed this entrance? formed the gateway to the route to Valcarlos in Spain. After experiencing this form of omission twice in one day, I began, as always, to ponder its symbolic ramifications. What else in life have I passed over or not seen, thinking it was not there or unavailable, when it was indeed? I recognize that my impatience or fear often makes me give up too soon. Usually, if I can’t readily find what I’m looking for, I stop the search. When challenged or beyond my comfort zone, whether it’s due to fatigue, frustration or downright orneriness, I normally grumble about waylaid plans. I stop trying. This is different from the spiritual concept of surrender. In that case, I can recognize, with some humility and grace, that my desired answer or solution might not be immediately visible. I can choose to trust that it will come later, perhaps in an unexpected form. What makes me let go, trust, and persevere in some cases, and give up in others? If my goal is clear and deeply felt, such as a creative project, I will pursue it relentlessly. 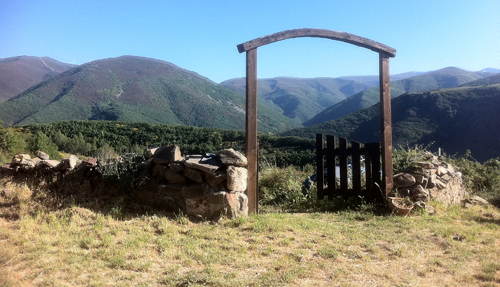 Like life, the Camino is a series of portals and thresholds. The most obvious ones are physical access points: doorways, gates, and windows or stairs leading into an enclosed space, perhaps a church or sanctuary. The mental and emotional thresholds, whether it’s leaving an unsatisfactory relationship or changing an attitude that no longer serves us, are more difficult to face. I love the notion, both literally and symbolically, of crossing a threshold. The hero’s journey, exemplified by Joseph Campbell, is a great archetypal example. Stories and cultural tales of all kinds, whether it’s a knight slaying dragons or Rosa Parks refusing to give up her bus seat to a white man, feature people who cross thresholds. Crossing thresholds, big and small, determines who we are and aren’t. When we face a fear and overcome it, that’s huge. 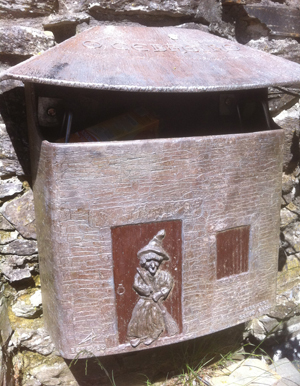 I’ll share the story of an Irish pilgrim named Anne, whom I spent time with along The Way. Ever since a dog bit her when she was a child, she had a tremendous fear of these animals. While walking alone on the Camino, three dogs approached her. But as they got closer, she didn’t run or skulk. Instead, she raised her walking sticks, yelled, and ran towards them. The dogs ran away. 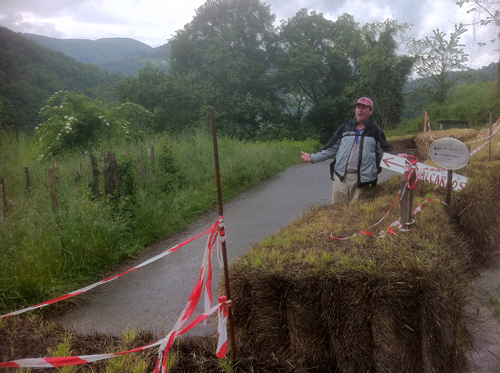 I give myself credit for having crossed many big thresholds, from a mountain climb to the Camino Frances itself, but my response to the little ones still needs work. I have never consumed wine as often as on the Camino. Every day, a full bottle of delicious vino blanco or riojo came included in a Pilgrim’s Menu, the discounted three-course meal offered by restaurants along the route. Even some albergues sold wine. One displayed a bottle of red at the front counter, available for only 1.5 euros (about two dollars). With a wonderful homemade label—“un buen vino para un buen camino” (a good wine for a good Camino)—it was made by the next-door neighbour, who had his own vineyard. 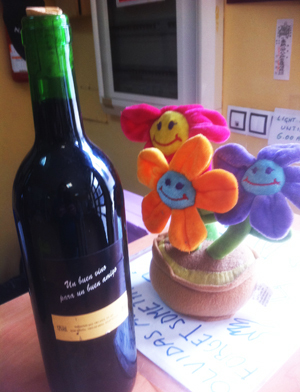 The verse and sentiment appealed to me, so I bought a bottle and shared it with some pilgrims and a hospitalero. Previously, they were all sitting alone and silent at a table; within minutes, we were laughing and telling stories. 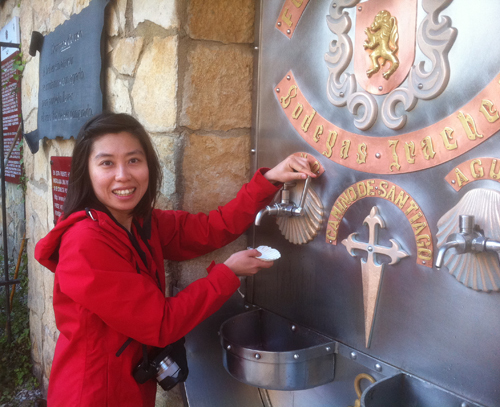 Throughout the Camino, I tried not to indulge, but the easily accessible liquid offered too much temptation. How could I resist sampling the fresh local stuff while walking through Spain’s primary Rioja wine region? After passing all those acres of vineyards—the country has the most “planted surface area” in the world, according to the website Wines from Spain—I felt obliged to offer my cultural appreciation. I had expected some simpler, mini-version of the Bellagio Hotel’s fountain in Vegas, spouting plumes of red wine like a circle of tiny geysers. In full decadence, a ring of pilgrims could open their mouths and allow the lush liquid to fall directly onto their waiting lips. Arriving at the winery at about 8:30 a.m., I looked forward to trying a novel tipple. But the tap, which is supposed to operate for 12 hours daily, starting at 8 a.m., was dry. I had to settle for mere water from the tap beside it. Overall, Spain helped me adopt a new view of red wine. In North America, I rarely drink it since it usually gives me a headache. 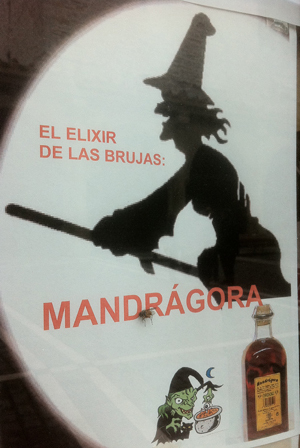 But in España, I could try glass after glass with no negative side effects at all. Even at the Palomar Restaurant in Atapuerca, after sharing a night of fun, songs, and many bottles of red wine with a tableful of European pilgrims, I expected to wake up with a monstrous pounding head the next morning. But I felt almost nothing. 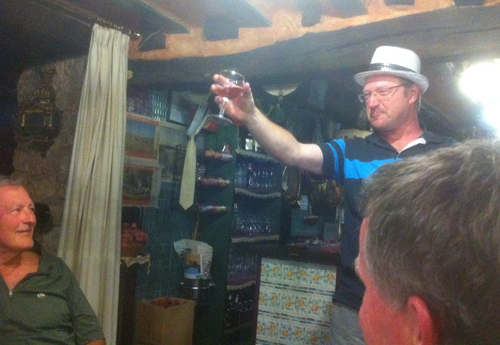 A Bavarian pilgrim entertains our international group at the Palomar Restaurant in Atapuerca. Was it because Spain’s local red wines have no preservatives? My German friend Elke, whom I met on the Camino, told me that in Germany, it is illegal to include additives in wine; perhaps a similar law exists in Spain. Of course, I had to sample some sangria, which was excellent. And for a white-wine lover like me, Spain’s offerings were dry and smooth. In a few places, the vino blanco was a strange orangey colour and more sweet than I like, but mostly, it tasted great. I’m certainly no connoisseur and never bothered to write down any labels, but I savoured everything I tried. Although I rarely drink beer, I did enjoy having the odd shandy decades ago, the British style of beer with lime. If you ask for this combo in North America, most waiters will look at you as if you’re loopy. So I was surprised to see bottles for sale in Spain with the two mixed together. Curious, I tried one and liked it. A few times, when I ordered a beer and lime, a bartender would never hesitate or look quizzical; he simply pulled out a bottle of flavoured lime and poured a healthy amount into a glass before adding beer. In Spain, beer companies have expressly targeted pilgrims in their marketing campaigns, knowing that thirsty people walking and sweating in hot sun will want to guzzle their product. Nearly every table, chair, and umbrella at every café or restaurant along The Way sported the name of a beer in bold letters. 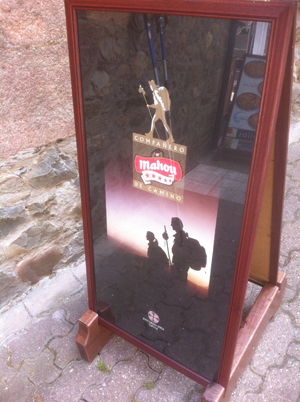 A sandwich board for Mahou beer showed two pilgrims silhouetted against a dusk sky, under the words “El Camino.” A sign for San Miguel beer, mounted on a tree, displayed an image of a pilgrim and gave the distance remaining to reach Santiago. I found this commodification of a contemplative journey troubling yet understandable, particularly due to Spain’s terrible economy. Presumably, these signs had not been updated in more than a decade. Two century-old companies, Mahou and San Miguel, merged in 2000, yet these signs still identified them as separate entities. All part of brand loyalty? Spain is supposed to have the highest beer consumption per capita in southern Europe, according to the Carlsberg Group website. According to Brewers of Europe, each person in Spain drank less than one litre of beer a week (an average of 48.2 litres) every year between 2009 and 2011. That’s well below Germany’s per-capita average of 107.2 litres, Austria’s 108.1 and about a third of the Czech Republic’s 145. In 2011, the average for the European Union as a whole was 68.9 litres. It bothered me seeing some of the same pilgrims getting routinely drunk along the route—although I was hardly a teetotaler. 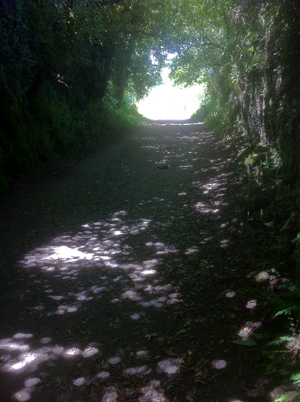 To me, overindulgence, rather than balance and moderation, is part of the shadow side of the Camino. I overhead some men, while drinking beer on a patio, say that they obviously wouldn’t be “attending a meeting” while on the Camino. Were they referring to AA? As the daughter of an alcoholic, I have had a pattern of attracting men who drink too much. I do not enjoy being around heavy drinkers, but understand the nature of addiction. We all choose how much light and darkness we want in our lives. We can all strive to find balance, every day, in whatever form that works. UPCOMING WORKSHOP: Inspired by my Camino pilgrimage, I’m hosting the workshop “Twelve Gifts of the Camino: a SoulCollage® Journey” on Saturday, Oct. 5 in Sechelt, BC. For more information, contact me at hconn@dccnet.com or see the 2013 schedule on the Sunshine Coast SoulCollage® website.